The patented CIT-1 installs and removes "F"-type coax connectors in high-density and hard-to-reach locations, and is perfect for working with bent coax. It provides enough leverage to achieve 30 inch-pounds-force torque by hand. Insure proper connections and reduce the potential of loose connector-related service calls. 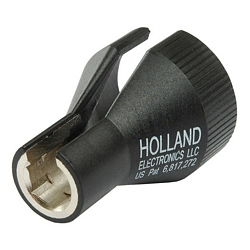 Pros: This product quickly and easily screws in those sometimes difficult RG-6 connections. A definite time saver and finger saver! Favorite purchase yet! Other Thoughts: This is a must for everyone's tool box.